Colonnade of pillars in the Viravasantaraya Mandapa, Minakshi Sundareshvara Temple, Madurai. bl.uk > Online Gallery Home	> Online exhibitions	> Asia, Pacific and Africa Collections	> Colonnade of pillars in the Viravasantaraya Mandapa, Minakshi Sundareshvara Temple, Madurai. 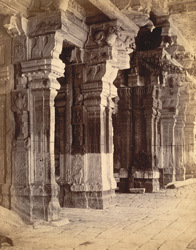 Photograph of the colonnade of pillars in the Viravasantaraya Mandapa at Minakshi Sundareshvara Temple in Madurai, taken by Nicholas and company in c. 1882 as part of the Archaeological Survey of India Collections (Indian Museum Series). The great complex of the Minakshi Sundareshvara Temple (17th century), dedicated to the goddess Minakshi, consort of Shiva, is contained within a vast enclosure entered through tall gopuras or towers completely covered with figures of divinities, celestial beings, monster masks and animals encrusted in plaster decoration painted in vivid colours. The Pudu Mandapa is situated in front of the east gopura and consists of a long hall with piers carved with yalis and portrait sculptures of the Nayaka rulers. This print shows an interior view of the Pudu Mandapa showing the richly-carved columns.